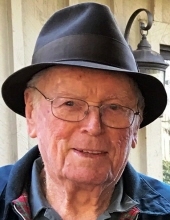 Howard Knox, age 91, of Knoxville passed away Wednesday morning, November 28, 2018 at his home. Howard was born in Neptune, Tennessee to Odell and Mattie Mae Knox. In addition to his parents, he is preceded in death by his wife of 62 years, Ora Lou McMahan Knox; daughters, Valerie Knox Mayfield and Terrie Knox Humberd; brothers, Harold and Ray Knox; sister, Helen Knox Smith. He enlisted in the Army Air Corps in 1946 and saw its conversion to the U.S. Air Force. He was very proud of that service.Howard was an alumnus of the University of Tennessee School of Engineering, and a proud member of the last generation of Slide-Rule Engineers, spending the majority of his career, twenty-eight years, with the Tennessee Valley Authority. After retirement from TVA in 1986, Howard and Ora Lou travelled extensively throughout North America. He could claim he slept in all fifty states, ten provinces, including New Foundland, two territories and multiple islands in the Pacific. He had driven as Far north, south, east and west as one can go by conventional roads in North America. After an initial trip in their Class A motorhome driving to Alaska in 1988, Howard, an avid RV enthusiast since the late 1960's, successfully designed and built two different RV units that over the next fourteen years would carry him to Alaska an additional eleven times. Howard was a man that lived his life on his terms. He was a loving and devoted husband, father, grandfather and great grand-father, and father-in-law. Like many men and women of Mr.Brokaw's "Greatest Generation", they were able to accomplish much with little. Howard was a designer with a patent or two to his credit, and many for which he wasn't credited. Once his head was set on an idea, he wasn't to be deterred. Howard Knox was, being a slide-rule engineer, a disassembler of devices and a voider of warranties. He is survived by his children and their spouses, Carolyn & Bruce Webb, and David & Patricia Knox; son-in-law's, Quentin Humberd and David Mayfield; grandchildren and spouses, Meredith and Bill Goff, Jessica and Jacob Potts, Courtney and Todd Kopriva, Elizabeth and Cory Holliday, Daniel Humberd, Allen Howell, Ellie Royce, Kevin Howell & fiance Rachel Cook; great-grandchildren, Knox Goff, Cade Goff, Joseph Potts, Liam Potts, Claire Kopriva, Laine Kopriva, Catie Holliday, Millie Holliday, Samuel Holliday, Savanna Howell, and Harrison Howell. The Knox family would also like to recognize and thank Carrie Davis, Rachel Cook, Jessika Nicholson, and friends Bill & Janet O'steen for their devotion to Dad during the times when he needed it most. Also, his beloved neighbors that kept an eye on Dad after Mother passed away. The staff from Smoky Mountain Hospice and staff and Caregivers from East Tennessee Personal Care also were integral in Daddy's comfort and well being. Thank you! The family will Celebrate Howard's life from 12 Noon to 1 p.m. December 15th at the Click Funeral Home Farragut Chapel. A Reception will be held immediately following the service at Milestones Event Center, beside Click Funeral Home. In lieu of flowers, memorials may be made to Second Harvest Food Bank www.secondharvestetn.org, American Cancer Society, www.cancer.org, Young Williams Animal Shelter, www.young-williams.org or to the Friends of Cheatham County Public Library, Ashland City, Tennessee. Click Funeral Home, 11915 Kingston Pike is serving the Knox family. To send flowers or a remembrance gift to the family of Howard William Knox, please visit our Tribute Store. "Email Address" would like to share the life celebration of Howard William Knox. Click on the "link" to go to share a favorite memory or leave a condolence message for the family.